If you’re looking for a professional moving service that has its roots in Northern Utah; if you want the security and efficiency of a professional moving crew that has been drug screened and background checked; if you want the peace of mind knowing that the local moving company you hired is federally licensed, bonded, and insured, then send an email to Moving Connections or give us a call. Moving Connections is your Provo moving service that not only fulfills all of the requirements above, but also selects its employees only from experienced professional movers. In addition, Moving Connections is a Moving Company offering various services and packages for reasonable rates. We not only offer full service residential moves, but we also offer a potentially cost-saving "labor only moving help" move. Of course, we offer a full range of business moves, from a single office move to a nearby location (even in the same building) to a complete corporate transition to a new city. Moving Connections has a very competitive hourly rate with a straightforward transparent pricing policy: you pay an hourly rate for labor time, which includes drive time to your location, plus drive time back to our offices minus ½ hour, plus the cost for any boxes or tape we use. You do not pay for stretch wrap, our professional quality quilted blankets or moving pads, or dollies, piano boards, etc. In addition, there are no fees: no junk fees, no fuel surcharges, and certainly no taxes. So you just pay for labor, plus boxes and tape. Simple and straightforward. If Moving Connections is moving you to Provo it's a perfect time to begin to utilize the many resources and bounties of Provo. For example click on the picture to the left to go the Moving Connections 'Support - Advice - Assistance' page and discover Provo for the first time. Once you are on the 'Support - Advice - Assistance' page go ahead and open the .pdf link found there and tape the list of emergency and useful phone numbers on your refrigerator. Moving Connections has gone to great pains to find those links and connections to integrate you quickly into Provo life. If you have a lot of household goods and you want to save some money, check out Moving Connections’ “labor only” move. Think of it as your Provo budget move. You save money because you provide the moving truck (usually from a truck rental company), you provide the driver for the truck, and you do most of the packing yourself. Moving Connections just sends two men to take care of the larger items (mostly furniture and exercise equipment, etc.) while you pack the other household items. Our Provo “labor only” crew will then load these items onto the truck that you have rented. Then you drive away to your new destination having saved some money because you’ve reduced our labor time. 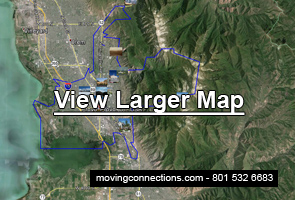 If you’re searching for an affordable professional moving service, then check out Moving Connections, a local moving company that specializes in residential and business moves along the Wasatch Front. Moving Connections has been in the shipping and local moving business for more than thirty years. It has a Federal Motor Carrier Number, meaning that it is federally licensed. In addition, Moving Connections is insured and bonded in accordance with federal regulations for a federally licensed mover. So you know that Moving Connections is a legitimate moving business. But you should also know that our employees are drug screened and have their backgrounds checked. When you add to that the fact that our moving crew members are selected only from experienced movers, then you know that you’re dealing with a moving company that is in conformity with the highest standards for the moving industry. We at Moving Connections like to think of ourselves as being in the business of moving families, not objects. So think of us as your local Provo residential moving service. We are eager to make your Provo transition smooth and seamless. That’s why our full service local move is the most popular service that we offer. Whether you’re just moving your business to another floor in the same building, or you’re packing up and heading for another city, Moving Connections has the moving solution for you. Moving Connections has been performing local business moves along the Wasatch Front for years. And with our credentials – federally licensed, bonded, and insured with a federal motor carrier number – we are a serious, top notch local moving service. But no business is any better than its employees. That’s why we not only drug test and background check all of our employees, but we also only hire those who have experience in the moving industry. Another reason that Moving Connections is a top contender for local office moves and corporate relocations in northern Utah is our transparent and straightforward pricing policy. You pay only for labor and driving time, plus boxes and tape. With Moving Connections, there are no junk fees, no hidden fees, nothing added on, no taxes, and no fuel surcharges, etc. You pay just for time and consumables. You don’t even pay for stretch wrap, much less for the use of dollies, piano boards, blankets, pads, and other equipment. Those are all included at no extra cost.